At Renewal Body Works we use only the finest materials and latest technology to repair your car. With the Car-O-Tronic TM, we are proud to offer the number one electronic frame and unibody measuring system in the world. The Car-O-Liner Bench Rack complements this system by allowing our body technicians to restore your vehicle back to factory specifications. As applied by our certified paint technicians, the Dupont Cromax Pro waterborne basecoat system in accordance with VOC Regulations provide a consistent, factory-like finish. Regardless of your vehicle’s make or model, this system allows us to give you accurate color matching and long lasting durability. Renewal Body Works also offers the ultimate convenience while your car is being repaired with an on-site Hertz Local Edition. Renting a replacement vehicle has never been so easy. Insurance companies have created an auto claims process generally known as Direct Repair Programs (DRPs). These programs are designed to speed up the claims handling and repair process of your vehicle. 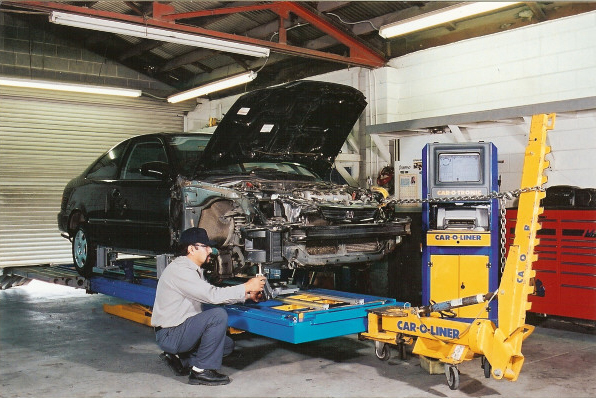 Qualified shops join these programs by having state-of-the-art equipment as well as technicians certified by ASE and I-CAR. After an accident, call your agent or claims office to get the ball rolling, then ask our friendly office staff which programs we participate in. They can help eliminate the hassle of waiting for an appraiser or driving to a remote claims office. You can relax in the knowledge that Renewal Body Works will deliver timely, quality repairs that are backed by a written, lifetime warranty. With the Sandoval name at stake, you can be sure the service will be first class. So, if an accident happens, revive your vehicle at Renewal Body Works. You’ll be glad you did.